Grand Rapids Forklift Certification, Get Forklift Training in Michigan! Located about 30 minutes away from Lake Michigan on Michigan’s west side, Grand Rapids is a bustling city with a tremendous amount of growth within the past few years. It is now known as a cultural hub, the perfect place to enjoy fine art, an excellent place to enjoy a microbrew, and the home to hundreds of different job opportunities. Forklift drivers are needed all throughout the city to perform many different types of tasks, from construction work to lifting heavy art installations. The best way to ensure your company is OSHA complaint is with Grand Rapids forklift certification. If you’re an employer looking for more qualified operators, forklift training in Grand Rapids, Michigan is imperative for a safe, well-run facility. Training is the employer’s responsibility – and ForkliftCertification.com can help with your forklift certification in Grand Rapids! With three different training packages, we’re the number one choice for convenient, online training – and it’s all OSHA compliant! We help companies with their training needs, simply because Grand Rapids forklift training is tough to take care of alone. 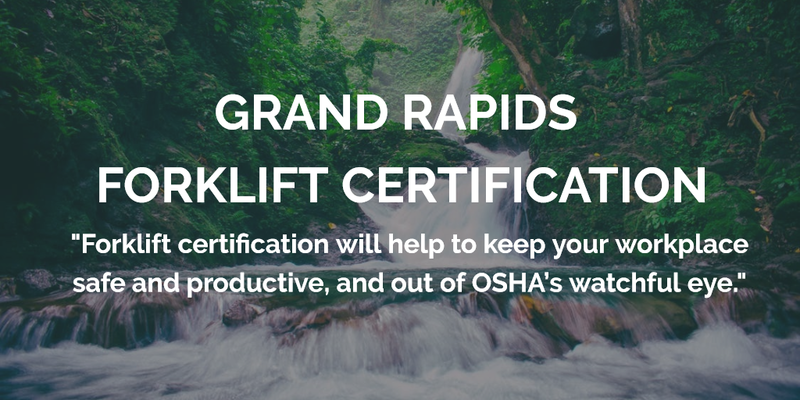 With our expert, OSHA-approved training packages, you’ll have everything you need for the most comprehensive forklift certification in Grand Rapids! Why Is It Important to Get a Grand Rapids Forklift Certification? Forklifts require specialized training – and ForkliftCertification.com has forklift certification in Grand Rapids for a great price. By first completing forklift training in Grand Rapids Michigan and receiving your certification, your employees are cleared to operate your entire forklift fleet! It all starts with our Grand Rapids forklift training. Requiring employees to have their Grand Rapids forklift certification will help to keep your workplace safe and productive, and out of OSHA’s watchful eye. What Does Forklift Training in Grand Rapids Michigan Teach? When you sign up for a forklift training course, your employees learn how to operate a forklift, the different types of forklifts including warehouse forklifts and rough terrain forklifts, how to perform equipment inspections, how to assess the surrounding environment, and how to avoid accidents. Once you receive your forklift certification, you’ll qualify for these positions: Forklift operator, forklift mechanic, dock worker, warehouse employee, special events worker, brewery worker, museum worker, and more! And the many countless breweries Grand Rapids is famous for! Get started with our Grand Rapids forklift training today. It is 100% OSHA compliant and comprehensive. It also can be completed in only about one hour and from any device with an internet connection. Plus, it’s a great value as well! Grand Rapids forklift certification has never been this convenient, easy, or affordable! Learn more about the forklift classes we offer, which include Warehouse Forklifts, Pallet Jacks and Order Pickers, and Rough Terrain Forklifts at ForkliftCertification.com. Please call us at (888) 278-8896 to learn more about our forklift certification in Grand Rapids! See why Grand Rapids employers rely on ForkliftCertification.com for all their training and compliance needs! See why we’re the best option for complete Grand Rapids forklift training. We look forward to hearing from you soon!